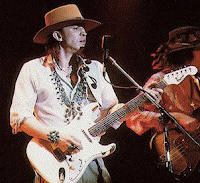 iconic guitar.com: Stevie Ray Vaughn - "Charley"
Stevie Ray Vaughn - "Charley"
Charley was a Stratocaster-style guitar that was assembled from spare parts by Charley Wirz of the Charley’s Guitar Shop in Dallas. Wirz often worked on Stevie's guitars and remained a close friend until he died in 1984. Charley is all-white with a rosewood neck. On the back is a girlie-style pinup caricature and carved into the neck's heel plate are the words "To Stevie Ray Vaughan, more in '84”. 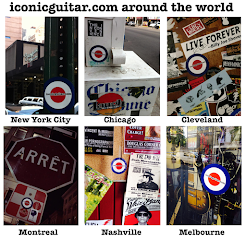 The headstock has been imprinted with a "Charley's Guitar Shop" logo. Wirz installed three Danelectro "lipstick tube" pickups and rewired them to his own configuration. This provided Stevie Ray the tone for such tracks as "Couldn't Stand The Weather", "Tin Pan Alley", and "Life Without You" (which is actually a tribute to Charley Wirz). Labels: Stevie Ray Vaughn - "Charley"